Wineries and vineyards in Wellington are becoming more well known. Not usually noted for its wine, Wellington is catching up, thanks to the trade done in nearby Wairarapa. In the CBD you'll also find some very fine wine shops. Wellington wineries and vineyards are traditionally centred further north, around the Wairarapa Valley. Martinborough and Masterton are where most local people would get their wine, and you can join a guided tour out of Wellington, that visits these vineyards. 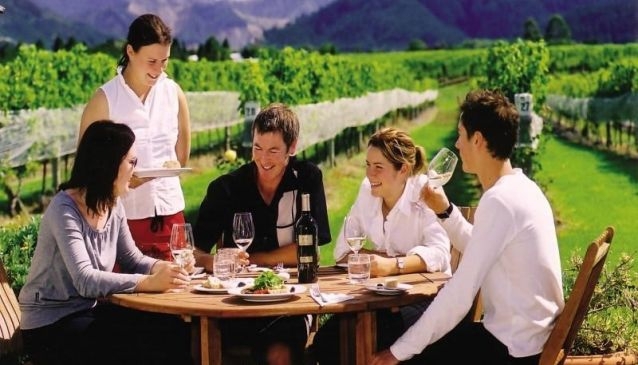 There are numerous guided wine tours leaving from Wellington, including day trips and overnight trips. Established over 20 years ago, The Murdoch James Estate, is one of Martinborough's pioneering wine producers. Their Blue Rock Vineyard enjoys a relaxing setting offering visitors a vineyard tour, tasting area, dining on the deck of the Bloom Restaurant and accommodation.